Have you ever read a book and immediately thought this is exactly what I needed to hear right now? The title. I love the idea that no ideas are original – takes the pressure off. The subtitle: 10 Things Nobody Told You About Being Creative – l have struggled with the word creative for most of my life. I mistakenly thought it meant producing fine art and I’m so relieved to find out that isn’t the case. Garbage in, garbage out. The idea that artists selectively collect ideas rather than hoard whatever they can find. I think this goes for everything – from the books you read to the TV you watch – find the good stuff. School yourself – be curious and let yourself fall into your curiosity. Find out everything you can about stuff. I do this naturally, so I was happy to get this instruction. Fake it until you make it – aka my current favorite quote from Tina Fey – “Say yes, then figure it out later.” Don’t wait until you are sure, do it and you’ll figure it out later. Write the book you want to read. Enough said. Step away from the screen. I’ve been doing this lately channeling my inner Rosie by writing on yellow legal pads and following Sarah’s Self-Care Tip #1. Be Boring – It’s the only way to get work done. An entire chapter dedicated to self-care! The ideas in this book are completely doable. This book helped me feel less stuck. I’ve been feeling like I’m in a rut lately and this book – with its tiny bites of wisdom – shook me out of it. I was left wanting more. Not such a bad thing, right? I’m having trouble answering this one because of the differences in our ages and genders, but based on the book he wrote – yes. If nothing else, we’ve always got twitter. 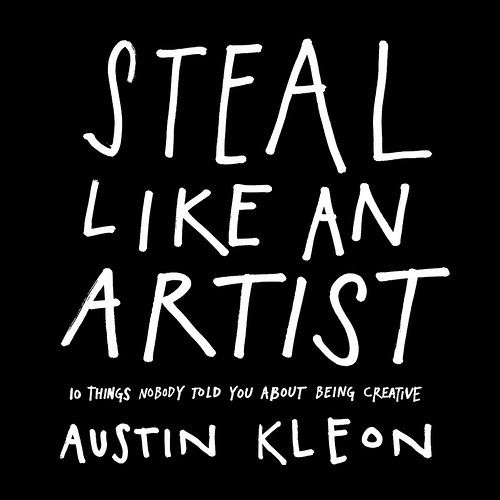 Should you read Steal Like An Artist? Absolutely. It has inspired me and it may do the same for you. Tiny bits of wisdom in an asthetically pleasing little book. Have you read Steal Like An Artist? What did you think? This entry was posted in Books I Love, Self-Care and tagged Austin Kleon, book review, Books I Love, Steal Like an Artist by Teacher Goes Back to School. Bookmark the permalink.